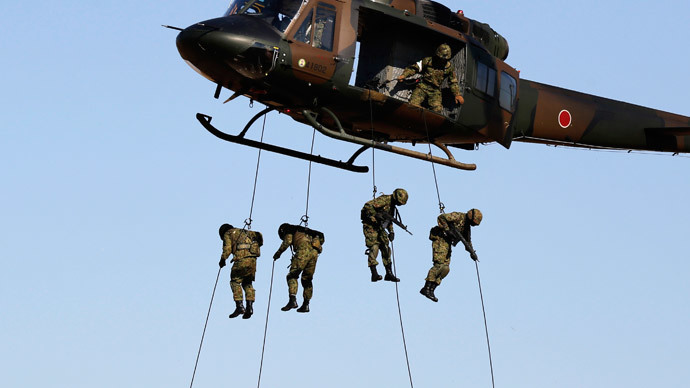 The cabinet of Japanese Prime Minister Shinzo Abe has approved legislation authorizing Japan to expand its military capacity beyond self-defense, allowing it to play a greater international role. The bills will now be debated in parliament. If passed into law, the bills would overturn a US-drafted pacifist constitution signed by Japan after its defeat in World War II, which banned the use of force as a means of settling international disputes. Abe says the existing legislation leaves Japan vulnerable amid China's increasingly assertive presence in the region, adding that Tokyo should be better prepared to defend itself while doing more to aid international peacekeeping efforts. The bills would remove geographic restrictions on where the military can operate, making it easier for Japan to support other militaries. It would allow Tokyo to use force under certain conditions, such as when an attack on another country carries a threat to Japan. The legislation is expected to be sent to parliament for debate on Friday. The bills are likely to be passed, as Abe's ruling coalition has a majority in both houses. It comes after Tokyo approved its largest military budget in 70 years in January, raising it to nearly 5 trillion yen (US$42 billion). Opinion among the Japanese public is divided. According to a Yomiuri newspaper poll published Monday, 46 percent of respondents are in favor of the legislation, while 41 percent are against it. However, a survey conducted by Japan's NHK television produced different results, showing that slightly more people opposed the bills. Hundreds of people rallied outside Abe's office on Thursday, calling the bills “war legislation” aimed at turning Japan toward militarism. They believe the move would erase nearly 70 years of efforts by Tokyo to regain international trust. A larger demonstration also took place on Tuesday, with around 2,800 people protesting in Tokyo's Hibiya Park, according to organizers. Those in attendance included members of the Democratic Party of Japan, the Japanese Communist Party, and the Social Democrat Party. The move by Abe's cabinet has also prompted reaction from South Korea and China. "We hope that Japan can earnestly learn the lessons of history, uphold the path of peaceful development...and play a constructive role in this Asian region," Chinese Foreign Ministry spokeswoman Hua Chunying said, as quoted by Reuters. Relations between Japan and China have been strained by a territorial dispute over a group of islands in the East China Sea, with both countries claiming ownership. The islands, which are controlled by Japan, are close to important shipping lanes, offer rich fishing opportunities, and are located near potential oil and gas reserves. The Japanese navy held a joint military exercise with the Philippines in the disputed South China Sea on Tuesday while the country's coast guard worked with Vietnam, thereby boosting maritime ties with two nations at odds with China over the waterway. It was also reported last month that Tokyo was considering joining the US in maritime air patrols in the South China Sea, in response to China's assertive pursuit of territorial claims. Abe vowed to pass the legislation to back up last month's new defense guidelines between the US and Japan, which were aimed at expanding the alliance between the two countries and allowing Tokyo to come to the aid of US forces threatened by another country.